Acting is not something I have ever had the opportunity to try. That said, yes, I do think I would enjoy it. I’m just thinking about how much fun it would be to become a whole other person for a period of time, rather like going on vacation, where no one knows you. Obviously, there are limitations. I mean, at five feet zero inches (approximately 150 cm), I’m never going to be able to play a giant. And if you have a high-pitched voice, you’ll never succeed as a basso profundo. But to be able to change your wardrobe, your mannerisms, your hair style, maybe even your voice, if you can manage that – higher? lower? foreign accent? – that could actually be a great deal of fun. You could even infuse something of yourself into the role (or not – Eliza Doolittle with a Brooklyn accent?! Fuh-geddaboudit!). But if, for example, you were a knitter (like me), you could make your knitting a part of your persona, and that would help to make your character more convincing. Well – okay – maybe not if the role was Sally Bowles in Cabaret, or the tough, street-smart cop Melanie Griffith was supposed to be in A Stranger Among Us (great movie, great premise, ruined by Griffith’s sleep-walking through her role). But I can’t think of too many other roles where it couldn’t work. However – I could only do this if I could “play” with my lines. I mean, I know you’re supposed to memorize lines. And I’ve seen the hilarious out-takes of shows where the actors flub their lines, and a serious scene is ruined by someone tripping over his own tongue, something like Waffly Wedded Wife (or not – this particular instance, while a prime example of tripping over one’s own tongue, made this wedding memorable for thousands more people than actually attended the event). Anyway, my point is that to be able to act successfully, I would need to be able to “massage” my lines, that is, not spit them back word for word. The actor Jimmy Steward did something like this with his first role, in which he played a butler with exactly two lines: “Mrs. Smythe-Jones will see you now,” and “Mrs. Smythe-Jones is going to be awfully mad,” or something along those lines. He played the role every single night, in addition to two matinees per week, and he said he got through it by altering his tone of voice and the way he said the words for every single performance. That kind of artistry caught the attention of a Broadway producer, and the rest is history. If I could do that – play with my role, have fun with my role, infuse something of myself into my role, and still actually become another person altogether for a period of time – yes, I think I’d love acting. Mirror, Mirror on the Wall, Whose Eyes Are Fairest of Them All? Hah! My first reaction was, I’d change them in a second. When I was a girl, I couldn’t tell what color my eyes were, and it drove me crazy. They weren’t brown, and they certainly weren’t blue. Around the time I reached maturity (chronologically speaking), I realized that the color I look best in was brown, and that settled it: I wished, with all my heart, that I had brown eyes. Not a wussy brown, either – dark, rich chocolate brown. Yum. I married a brown-eyed man, and our son has brown eyes, and i used to love looking into them when he was a baby and a small boy. And I had a friend who had ice-blue eyes, a really striking color. I knew a girl at work who had ice-green eyes, also striking, and I knew a man at work who had sapphire-blue eyes – how often do you see that? Most people with blue eyes have a light-blue color. All of them were preferable to whatever-the-heck color my eyes were – at least you could tell what color they were. My eyes were so nondescript that on my driver’s license, I listed them as “hazel,” since I had no idea what hazel looked like and I had no idea what color my eyes were. Then one day, somewhere in my thirties, I took a really good look at my eyes and realized that they were a color, after all: they’re green. They aren’t that wonderful ice-green, and they aren’t forest-green, but they are definitely green, and while I’m not crazy about being the Green-Eyed Monster – yes, I know that refers to jealousy, but the association is inevitable – I do actually like having green eyes. It’s an unusual color, distinctive, even, and it helps to keep that in mind when shopping for clothes and accessories. I rarely, for instance, wear anything blue or black. Lots of green, lots of cranberry, and yes, brown is still my favorite color, and will be as long as my hair retains even a modicum of that color. I think I’d like a green car. 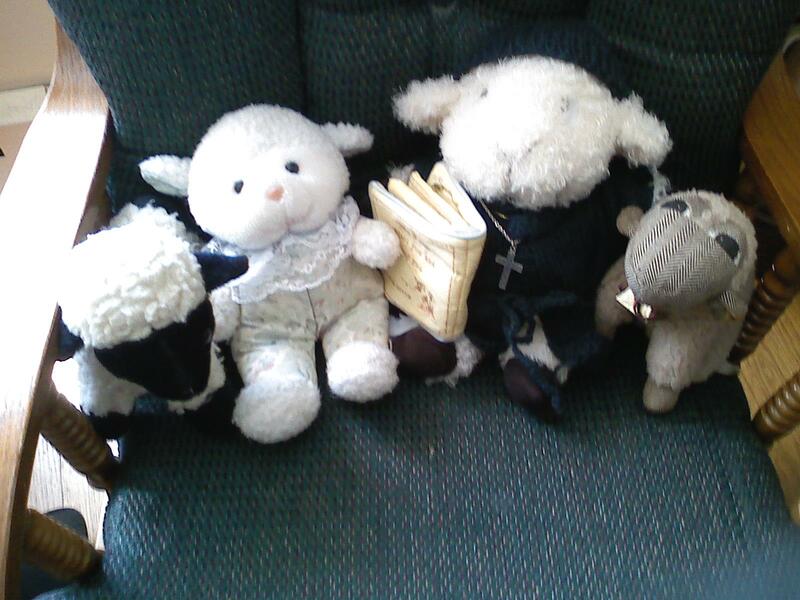 From left: Abby, Millie, Fr Baarsanuphius, and the most senior member of the flock, Mrs. Mutton. Mrs. Mutton has been with us for 25 years now. She was an anniversary present at a time when knitting was my primary creative outlet, and she remained our sole sheep until 1997, when my husband was hospitalized with a blood clot. In Boston. While I was holding down the fort with two kids (one in college, one in high school at the time, but still), a job, and my very final exams coming up — the ones before I completed work on my degree. 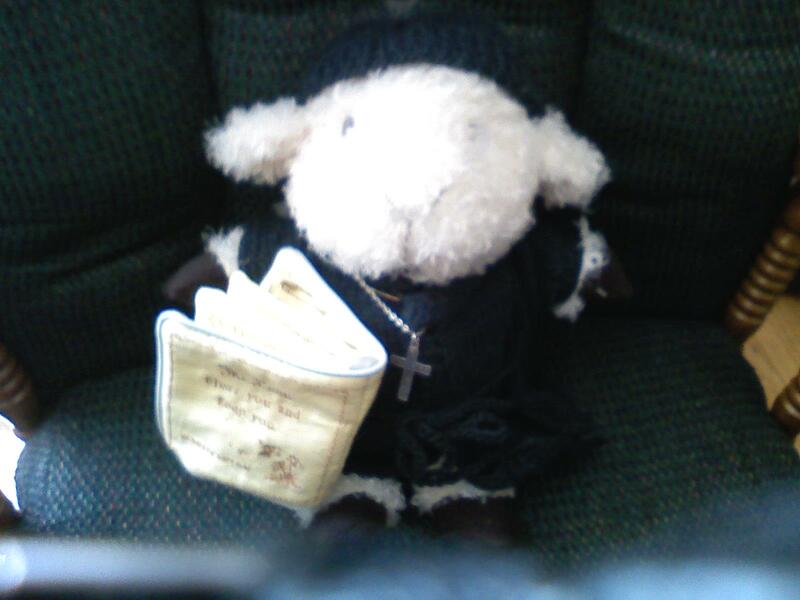 Getting down to Boston to visit him involved so much figuring out and planning that he was home before I had figured out how to do it; but when I got word that he was there, I sent him flowers and a toy sheep to keep him company. The toy sheep accompanied him home; he named her Millie for the millefleurs decorating her. Abby was something he couldn’t resist, a stuffed lamb from a Scottish gift shop, and you already know how “Father Baa” came to live with us. This was my first opportunity to post photos, since completing his riassa and skufia. Since Wednesday afternoon, I have been wrestling with a cold, but hope to get back to my cross stitch once I’m feeling civilized again. Somehow, knitting isn’t as satisfying as it was 25 years ago; maybe that’s because I’ve mastered most of the really interesting projects, including making socks, intarsia (think Argyles), Shetland knitting, and Arans and Ganseys. The only thing left to learn, that I can think of, is how to knit two socks at the same time, like that old peasant nursemaid in War and Peace. If I ever nail that one down, I’ll let you know. There’s this thing out there that I only became aware of this year, called Eastern Christian New Media Awards (that is “new,” not “news” — I checked), wherein people nominate their favorite blogs in such things as Funniest Blogs, Best Theology Blog, and Best Domestic Blog — all, of course, from the viewpoint of an Eastern Orthodox life. A friend of mine posted about it, so I checked it out and voted for some of my favorite blogs — there were at least three that I would have liked to vote for in the Domestic category, but you could only vote for one. Phooey. However, I can and will mention that two of the Domestic blogs I would have liked to vote for, on one and the same ballot, are Mimi’s blog and Philippa’s blog. With competition like these ladies, imagine my shock when I saw my own blog among them. /jaw hanging open, eyes wide, drool f orming at the corner of my mouth/ OK, that last is a bit gross, but you get the idea. Whoever nominated Muttonings, thank you!! Winning isn’t remotely on my radar scope, but I’d love to know how many votes I got. And that’s all I have to say on the subject. For someone who’s supposed to be a writer, this is not good. But that’s how stunned I am. This test has very special meaning for my family: Our Chris used to love Winnie the Pooh when he was a little guy. I will never forget taking him and his sister to an Episcopal church one afternoon; I had no idea why, particularly, but dh had read somewhere about a showing of Winnie the Pooh (the Disney version — can’t have everything). Chris was absolutely enthralled, sat completely still for two hours, totally wrapped up in his favorite books come to life. And so was I. At the end, when Christopher Robin hints that he may be getting too old for Pooh, I actually cried — I could see the future right then. I just didn’t realize that having grown children could actually be sweet. ABOUT PIGLET: Piglet is a Very Small Animal, who used to live in his own house, a nice big tree. However, after Owl’s house was blown over by a storm, he “found” Piglet’s house, and Piglet didn’t want to tell him that the home was already lived in. So he went to live with Pooh. WHAT THIS SAYS ABOUT YOU: You are a rather nervous person, and you tend to worry about The Worst happening. You don’t really feel capable of dealing with the things that life could throw at you, and so you tend to fret about it. You are one of those people who seems to think that worrying actually accomplishes something… and your friends can’t help but love you for it. Your humble manner and self-deprecating ways make your friends feel good about themselves. They want to help and protect you. Your loving friends are always trying to encourage you to be more independent, and they are right. You need to develop a bit of self confidence and stand on your own two feet. Ah, I finally thought of a “good one” to post. A day late and a dollar short, as usual, but oh well. I usually send this out the first week in Lent, but I seem to have put it somewhere inaccessible, so I will post it here. OK. One day, a man moves into a small Irish village, and that evening, he takes himself down to the pub and orders three beers. Not one after the other, but three all at once. The bartender sets them up, the man drinks them one after the other, and goes home. By the next morning, this tale was all over the village, and the man’s stock rose greatly, for the Irish revere nothing so much as family relationships. “Well, only orderin’ two beers yesterday evenin’,” said the priest.